M106 is an X-Ray emitting Seyfert galaxy about 25 million light years from us. Most likely, the x-ray emissions are telling us that part of this galaxy is collapsing into a black hole. This possible supermassive black hole is believed to be as large as 36 million solar masses! This image also shows over 30 identifiable background galaxies including the fairly large galaxy, NGC 4248 at about 2 o'clock, as well as NGC 4231 and 4232 to the upper right of NGC 4248. In this photo, North is up. This image is cropped to 68% of the original full frame. Software Used Images Plus 4.5 for camera control, calibration, stacking, digital development, Lucy-Richardson deconvolution, multiresolution sharpening, smoothing and noise reduction. Photoshop CS5 used for levels and curves, color correction, high pass filter, star shrinking, saturation adjustments, lab color, sharpening, and screen mask invert. Gradient Xterminator for gradient removal. Carboni Tools for additional saturation adjustments, noise reduction, and smoothing. HLVG for additional color correction. 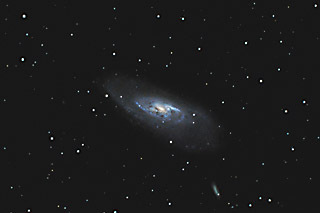 Notes This is the second time I've imaged M106, and I feel the time spent on this redux was well spent. 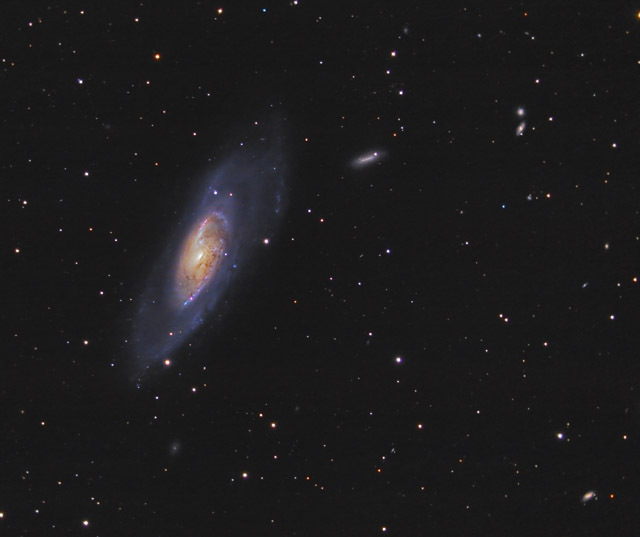 I'm very happy with the galaxy details I was able to capture with this image, as M106 has some very nice fine structures. I'm also happy with the final color balance I achieved, as well as the nice details in the outer halo. This image was published by Astronomy Magazine as its Picture of the Day for March 12, 2018!